In my profile of Aussie blues stalwarts Chain on this site, I refer to one of that band's founding members as having forged "an erratic but compelling solo career". 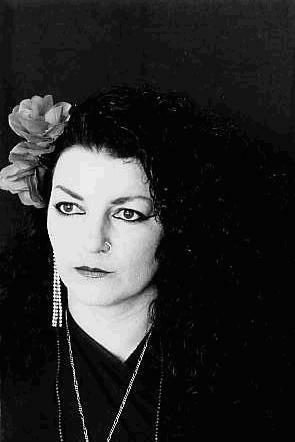 I try now to unravel for you the musical jounrey of the enigmatic Wendy Saddington. It's a crying shame that there is such scant recorded evidence of Wendy's talent -- just one studio single, one live album and a brief filmed performance -- so in Wendy's case we are forced to fall back on to apochryphal stories, together with some fans' treasured memories of some absolutely magical concert performances. 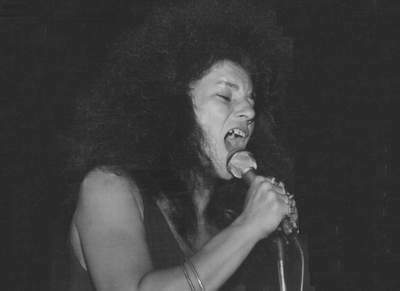 Wendy Saddington's musical influences included the likes of Bessie Smith, Etta James, Mahalia Jackson, Odetta, Aretha Franklin, Nina Simone, Janis Joplin, and the raw blues from the Mississippi delta, along with the swanky soul coming from the American Stax, Atlantic and Motown labels. There was also something of the vulnerability of Edith Piaf in Wendy's pleading, bleeding vocal entreaties. Saddington first came to notice in Melbourne psych-soul outfit The Revolution, before swiftly joining Adelaide's psychedelic/classically flavoured James Taylor Move around late 1967. Virtually all the members of this band went on to bigger and better things -- Peek, Tarney and Spencer all moved to the UK, where Tarney and Spencer became sought-after session players, writers and producers as well as forming their own successful band. Peek likewise became an in-demand session player in London and later linked up with renowned classical guitarist John Williams, and together they formed the enormously successful classical-rock fusion band Sky. As with most of Saddington's band collaborations, she had already left the band before any recordings were made. Such was again the case when Wendy joined the emerging blues-rock ensemble Beaten Tracks, which she named (The) Chain, after the song by one of her heroines, Aretha Franklin's soul classic, "Chain Of Fools". Wendy spent around 18 months touring with Chain, and it was during this time that her passionate, earth-mother Joplin/Franklin vocal style came to prominent notice among promoters and punters alike. Also, her 'outlandish' appearance attracted magazines like Go-Set: a sad waif-like face, heavily mascara-ed around the eyes, framed by the hugest of afro 'do' this side of Jimi's Experience! Wendy favoured simple Levi's, with a basic shirt or cheesecloth kaftan top, copiously accessorised with love-beads and bangles. During 1969 Wendy made a guest appearance on the short-lived ABC-TV program Fusions, an innovative 'in concert' series starring Sydney-based progressive band Tully. It's not known whether any tapes of this series have survived, but the recent rediscovery of a large number of episodes of the ABC's GTK series give hope that at least some of this series has sruvived.Circa 1969 Wendy also began writing a regular column in Go-Set., giving advice on love and relationships. Saddington's next musical outing was with Jeff St John's highly acclaimed and well-established group, Copperwine, and it's here that we finally have an officially-released recording of her sublime vocal performances! Wendy joined the band in March 1970, just after the release of Copperwine's superb Joint Effort album, and she sang live as co-lead with St John for a concentrated touring regime through to February 1971. In January of that year, with St John temporarily away from the band, Saddington fronted Copperwine for their acclaimed performance at the Wallacia Festival on the central-coast of New South Wales. An live recording of the event was released on Festival's new progressive subsidiary Infinity during '71, which showcased Copperwine's sympathetic backing sensibilities for Wendy's distinctive vocals. On such cuts as the funky opener, Nina Simone's "Backlash Blues", and her heartfelt reading of Dylan's "Just Like Tom Thumb's Blues", Saddington continually astonishes with her sensual soul power. Another notable inclusion is Wendy's introspective and idiosyncratic reading of John Lennon's "Tomorrow Never Knows" (which Wendy introduces as a George Harrison composition!) Other highlights include "Five People Said I Was Crazy " (which, with its wild Ross East guitar solo, Barry Kelly's electric piano flourishes and Wendy's monumental banshee wail, certainly lives up to its title). The closing tour-de-force "Blues In A" completely satisfies the listener as a consummate combination of the music of one of Australia's premier all-purpose prog-blues bands of the time, with definitely one of our most unique and mesmerising blues-soul vocalists. In 2002, Festival announced that this sought-after album was scheduled for re-release on CD, remastered and with bonus tracks, as part of Festival Record's 50th anniversary re-release program, and although advance copies were distributed, the rapid decline in the company's fortunes led to the cancellation of the series soon after, and the Saddington/Copperwine CD was never released. Three years later, Festival-Mushroom had gone out of business and the recording archive was sold to Warner Music Australia for AU$10 million. Warner has started reissuing some former Festival recordings (beginning with remastered re-releases of the Split Enz albums) but their plans for the archive as a whole are not knwon, although with former rock writer Ed St John currently leading the company, it is to be hoped that more from the Festival-Mushroom archive will be forthcoming. Included on that advance review CD were both sides of wendy's superb 1971 single "Looking Through A Window", which she made with the aid of composers-producers Warren Morgan and Billy Thorpe and on which she is backed by The Aztecs. This stupendous record, which peaked at a creditable #22, in September 1971, should have been a major hit for Wendy. Returning the favour, Wendy co-wrote (with Morgan) the track "Mothers & Fathers", which appeared on the 1973 album Thumpin' Pig and Puffin' Billy (Downunda). After leaving Copperwine, Wendy's continued to perform in and around Melbourne at venues like the renowned Thumpin' Tum. In 1972 her performance style took on a much more theatrical bent, and she adopted a totally new stage persona, complete with costumes and white-face 'pierrot' makeup. She also put together a new backing band called Teardrop. They were regulars at the TF Much Ballroom and the Much More Ballroom in Melbourne; a recent photo exhibition in Sydney featuring rock snaps by "Jaques L'Affrique" (David Porter) included several terrific shots of Wendy in full flight on the TF Much stage. It was in this guise that Wendy and Teardrop were captured for posterity (along with The Captain Matchbox Whoopee Band and Spectrum)by director Peter Weir as part of his short film , which was made as part of the Commonwelath Film Unit's "Australian Colour Diary" series. Although the performances are tantalisingly brief, the segment featuring Wendy and Teardrop provides ample evidence of the mesmerising power of her voice. In March 1973 Wendy (playing the role of 'The Nurse') appeared alongside Daryl Braithwaite, Billy Thorpe, Broderick Smith and Keith Moon, in thelegendary 'arena' performance of Pete Townshend's rock opera, Tommy. She continued performing sporadically until the late 70s, working with various outfits such as the Blues Assembly, Shango, and later in the US, she briefly worked with the legendary Jeff Crozier. There were also occasional onstage collaborations with another eccentric performer, Jeff Duff. Wendy disappeared from view for several years in the late 1970s and early 1980s after she became deeply involved in the Hare Krishna movement, which had captured her interest in the early '70s. Wendy began performing again sporadically in the mid-Eighties. She put together the first incarnation of The Wendy Saddington Band in 1983, with jazz pianist Bobby Gebert, Harvey James (guitar; ex-Mississippi, Ariel, Sherbet, Swanee), Billy Rylands (bass) and Chris Sweeney (drums). She returned in 1986-87 with an impressive new lineup that featured Mick Liber (guitar, ex Python Lee Jackson, Third World War, Ashton, Gardner & Dyke), Angelica Booth (bass), Des "Animal" McKenna (drums) (Wilbur Wilde, Jo Jo Zep, Goanna) and Rose Bygraeve (organ, ex Goanna). The style of the '86-87 group has been described to us as "reggae hip-hop funk'n'soul, with Wendy at her 1987 best". This band cut one album at ENREC Studios in Tamworth but tragically it seems that someone at the studio subsequently lost the master tape. The band later burned a surviving cassette dub onto CD, but by that time Wendy apparently had "grown out of it and didn't want to release it cause it wasn't good enough". Our informant however insists that it was "the best singing I ever heard !!!! (and I grew up on gospel!)". We're glad to report that in more recent times, Wendy has made occasional performances. In 1996 she performed some low-key dates backed by an outfit known as Aniseed.Over the last few years she has appeared at late, lamented The Continental Cafe The Mercury Lounge, The Basement in Sydney, and the East Coast Blues and Roots Festival with bands such as Chain and Kevin Borich Express. One notable gig was captured on tape and this remarkable recording, One Night Jamm has been released on CD and is available through the official Kevin Borich website. The show featured Wendy (with her formerly dark corkscrew curls now bleached blonde) performing several numbers with the Express, and also features guest vocals and blues harp from Ross Wilson -- amazingly, this was the first time Kev and The Boss had ever played together! The band fires on all cylinders, and while time has inevitably taken a toll on that extraordinary voice, it is a startling performance from Wendy, and a testament to her enduringly exhilarating vocal skills. More recently, Wendy performed a few shows in Brisbane in early 2008 with a band that included her old colleagu, the esteemed Mick Liber. "Five People Said I Was Crazy"
Re-issue of the live album with "Looking Through A Window" added. Special thanks to Harley Parker, '"dizzym" and our anonymous source.